The TAC Festivalfounded & curated by Jennifer Famery-Mariani, has featured over 1000 artists, 180 exhibitions and 80 special events since its inception in 2016. It is also an ART MARATHON. Attendees can choose their own adventure mixing exhibitions with workshops, talks, demonstrations and performances. In just 3 hours, from 6-9 PM, visitors join together to attend a curator-led tour, learn a new skill in a creative workshop, watch a live dance performance, and discover the unexpected in a contemporary gallery they may have never found otherwise. 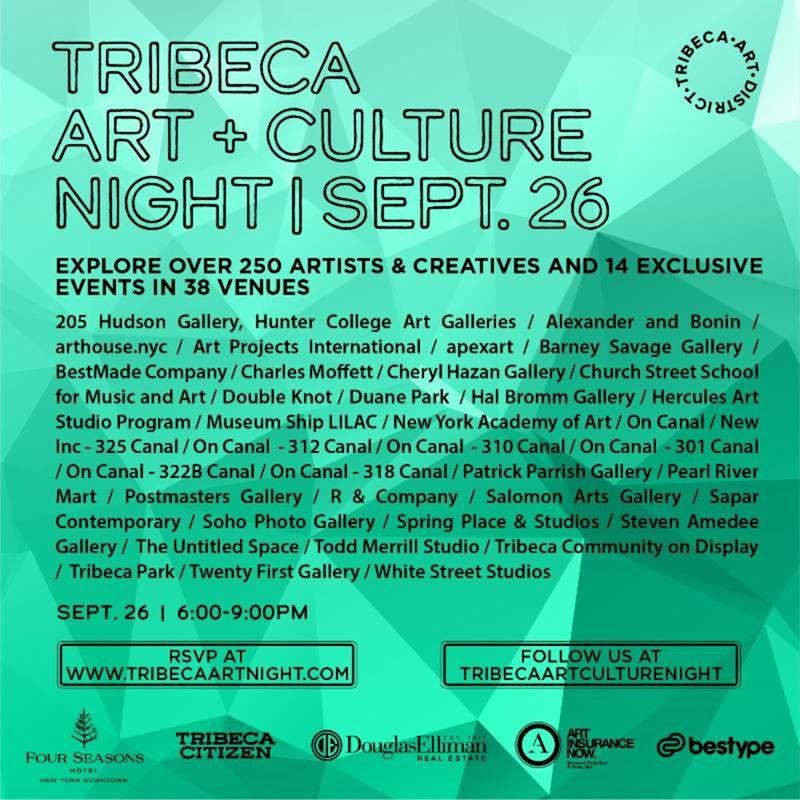 TAC Night is an adventurous playground showcasing artists, performers, curators, scientists, chefs, wellness experts, musician, designers, authors, thought leaders and makers. Diversity and exploration are the key words for our festival starting with the incredible variety of types of venues featured, through the different event formats available for the public to engage with art, to the range of content available during the festival. Highlights of previous editions included a a private tour of Daniel Buren’s in situ installation, a drawing workshop with artist Z. Behl, a neon making demonstration with Let There Be Neon, a one time performance of “Audience for one” by Jody Oberfelder, a private walkthrough of Michel Parmentier’s first US solo exhibition, an itinerant exhibition of a dance performance by Rourou Ye (Church St. School), a poetry reading by Max Blagg, an Afro-Dance workshop with Angel Kaba, a knife sharpening workshop (BestMade), a collector’s talk with art dealer Stefania Bortolami, a paper cutting performance with artist Xin Song, a perfume making workshop, an itinerant dance performance with BC+A, a puppeteer workshop, a live classical performance with Jung Sun Kang x Sing for Hope Pianos, an exclusive visit to 20 open artists studios, and so much more…. Previous Previous post: Kenny Scharf + Malia Scharf = the Scharftees Pop-Up at Allouche Gallery!